BY DR. HUNTER McGUIRE, MEDICAL DIRECTOR OF JACKSON'S CORPS. Supported upon either side by his aids--Captain James P. Smith and Joseph Morrison--the General moved slowly and painfully towards the rear. Occasionally resting for a moment to shake off the exhaustion which pain and the loss of blood produced, he at last reached the line of battle, where most of the men were lying down to escape the shell and canister with which the Federals raked the road. General Pender rode up here to the little party and asked who was wounded, and Captain Smith, who had been instructed by General Jackson to tell no one of his injury, simply answered, "A Confederate officer "; but Pender recognized the General, and, springing from his horse, hurriedly expressed his regret, and added that his lines were so much broken he feared it would be necessary to fall back. At this moment the scene was a fearful one. The air seemed to be alive with the shrieks of shells and the whistling of bullets; horses, riderless and mad with fright, dashed in every direction; hundreds left the ranks and fled to the rear, and the groans of the wounded and dying mingled with the wild shouts of others to be led again to the assault. Almost fainting as he was, from loss of blood, fearfully wounded, and as he thought dying, Jackson was undismayed by this terrible scene. The words of Pender seemed to rouse him to life. Pushing aside the men who supported him, he stretched himself to his full height and answered feebly, but distinctly enough to be heard above the din of the battle: "General Pender, you must hold on to the field; you must hold out to the last." It was Jackson's last order upon the field of battle. Still more exhausted by this effort, he asked to be permitted to lie down for a few moments, but the danger from the fire, and capture by the Federal advance, was too imminent, and his aids hurried him on. A litter having been obtained, he was placed upon it, and the bearers passed on as rapidly as the thick woods and rough ground permitted. Unfortunately, another one of the bearers was struck, down, and the litter having been supported at each of the four corners by a man, fell and threw the General to the ground. The fall was a serious one, and as he touched the earth he gave, for the first time, expression to his suffering, and groaned piteously. Captain Smith sprang to his side, and as he raised his head a bright beam of moonlight made its way through the thick foliage and rested upon the pale face of the sufferer. The captain was startled by its great pallor and stillness, and cried out: "Oh! General, are you seriously hurt?" "No," he answered, "don't trouble yourself, my friend, about me;" and presently added something about winning the battle first and attending to the wounded afterwards. He was placed upon the litter again, and carried a few hundred yards, when I met him with an ambulance. I knelt down by him and said, "I hope you are not badly hurt, General." He replied very calmly but feebly, "I am badly injured, Doctor; I fear I am dying." After a pause he continued, "I am glad you have come. I think the wound in my shoulder is still bleeding." His clothes were saturated with blood, and hemorrhage was still going on from the wound. Compression of the artery with the finger arrested it until, lights being procured from the ambulance, the handkerchief, which had slipped a little, was readjusted. His calmness amid the dangers which surrounded him and at the supposed presence of death, and his uniform politeness, which did not forsake him, even under these, the most trying circumstances, were remarkable. His complete control, too, over his mind, enfeebled as it was by loss of blood, pain, &c., was wonderful. His suffering at this time was intense; his hands were cold, his skin clammy, his face pale, and his lips compressed and bloodless; not a groan escaped him--not a sign of suffering except the slight corrugation of his brow, the fixed, rigid face, and the thin lips so tightly compressed that the impression of the teeth could be seen through them. Except these, he controlled by his iron will all evidence of emotion, and more difficult than this even, he controlled that disposition to restlessness, which many of us have observed upon the field of battle, attending great loss of blood. Some whiskey and morphia were procured from Dr. Straith and administered to him, and placing him in the ambulance it was started for the corps field infirmary at the Wilderness tavern. Colonel Crutchfield, his chief of artillery, was also in the ambulance wagon. He had been wounded very seriously in the leg, and was suffering intensely. The General expressed, very feelingly, his sympathy for Crutchfield, and once, when the latter groaned aloud, he directed the ambulance to stop, and requested me to see if something could not be done for his relief. Torches had been provided, and every means taken to carry them to the hospital as safely and easily as possible. I sat in the front part of the ambulance, with my finger resting upon the artery above the wound, to arrest bleeding if it should occur. When I was recognized by acquaintances and asked who was wounded, the General would tell me to say, "A Confederate officer." At one time he put his right hand upon my head, and pulling me down to him, asked if Crutchfield was dangerously injured. When answered "No, only painfully hurt," he replied, "I am glad it is no worse." In a few moments after Crutchfield did the same thing, and when he was told that the General was very seriously wounded, he groaned and cried out, "Oh, my God!" It was for this that the General directed the ambulance to be halted, and requested that something should be done for Crutchfield's relief. After reaching the hospital he was placed in bed, covered with blankets, and another drink of whiskey and water given him. Two hours and a half elapsed before sufficient reaction took place to <shv14_157>warrant an examination. At 2 o'clock, Sunday morning, Surgeons Black, Walls and Coleman being present, I informed him that chloroform would be given him, and his wounds examined. I told him that amputation would probably be required, and asked if it was found necessary whether it should be done at once. He replied promptly: "Yes, certainly. Dr. McGuire, do for me whatever you think best." Chloroform was then administered, and as he began to feel its effects, and its relief to the pain he was suffering, he exclaimed: "What an infinite blessing," and continued to repeat the word "blessing," until he became insensible. The round ball (such as is used for the smooth-bore Springfield musket), which had lodged under the skin upon the back of his right hand, was extracted first. It had entered the palm about the middle of the hand, and had fractured two of the bones. The left arm was then amputated about two inches below the shoulder, very rapidly and with slight loss of blood, the ordinary circular operation having been made. There were two wounds in his arm. The first and most serious was about three inches below the shoulder-joint, the ball dividing the main artery and fracturing the bone. The second was several inches in length; a ball having entered the outside of the forearm, an inch below the elbow, came out upon the opposite side just above the wrist. Throughout the whole of the operation, and until all the dressings were applied, he continued insensible. Two or three slight wounds of the skin of his face, received from the branches of trees when his horse dashed through the woods, were dressed simply with isinglass plaster. About half-past 3 o'clock, Colonel (then Major) Pendleton, the assistant adjutant-general, arrived at the hospital and asked to see the General. He stated that General Hill had been wounded, and that the troops were in great disorder. General Stuart was in command, and had sent him to see the General. At first I declined to permit an interview, but the colonel urged that the safety of the army and success of the cause depended upon his seeing him. When he entered the tent the General said: "Well, major, I am glad to see you. I thought you were killed." Pendleton briefly explained the condition of affairs, gave Stuart's message, and asked what should be done. General Jackson was at once interested, and asked in his quick, rapid way several questions. When they were answered, he remained silent for a moment, evidently trying to think; he contracted his brow, set his mouth, and for some moments was obviously endeavoring to concentrate his thoughts. For a moment it was believed he had succeeded, for his nostril dilated, and his eye flashed its old fire, but it was only for a moment; his face relaxed again, and presently he answered very feebly and sadly, "I don't know, I can't tell; say to General Stuart he must do what he thinks best." Soon after this he slept for several hours, and seemed to be doing well. The next morning he was free from pain, and expressed himself sanguine of recovery. He sent his aide-de-camp, Morrison, to inform his wife of his injuries, and to bring her at once to see him. The following note from General Lee was read to him that morning by Captain Smith: "I have just received your note, informing me that you were wounded. I cannot express my regret at the occurrence. Could I have directed events, I should have chosen, for the good of the country, to have been disabled in your stead. I congratulate you upon the victory, which is due to your skill and energy." He replied: "General Lee should give the praise to God." About 10 o'clock his right side began to pain him so much that he asked me to examine it. He said he had injured it in falling from the litter the night before, and believed that he had struck it against a stone or the stump of a sapling. No evidence of injury could be discovered by examination. The skin was not broken or bruised, and the lung performed, as far as I could tell, its proper functions. Some simple application was recommended, in the belief that the pain would soon disappear. At this time the battle was raging fearfully, and the sound of the cannon and musketry could be distinctly heard at the hospital. The General's attention was attracted to it from the first, and when the noise was at its height, and indicated how fiercely the conflict was being carried on, he directed all of his attendants, except Captain Smith, to return to the battlefield and attend to their different duties. By 8 o'clock Sunday night the pain in his side had disappeared, and in all respects he seemed to be doing well. He inquired minutely about the battle and the different troops engaged, and his face would light up with enthusiasm and interest when told how this brigade acted, or that officer displayed conspicuous courage, and his head gave the peculiar shake from side to side, and he uttered his usual "Good, good," with unwonted energy when the gallant behavior of the "Stonewall brigade" was alluded to. 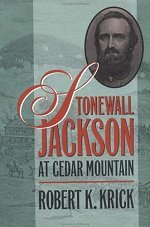 He said "the men of that brigade will be some day proud to say to their children, 'I was one of the Stonewall brigade.'" 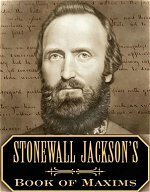 He disclaimed any right of his own to the name Stonewall. "It belongs to the brigade, and not to me." This night he slept well, and was free from pain. A message was received from General Lee the next morning directing me to remove the General to Guinea's station as soon as his condition would justify it, as there was some danger of capture by the Federals, who were threatening to cross at Ely's Ford. In the meantime, to protect the hospital, some troops were sent to this point. The General objected to being moved, if, in my opinion, it would do him any injury. He said he had no objection to staying in a tent, and would prefer it if his wife, when she came, could find lodging in a neighboring house; "and if the enemy does come," he added, "I am not afraid of them; I have always been kind to their wounded, and I am sure they will be kind to me." General Lee sent word again late that evening that he must be moved if possible, and preparations were made to leave the next morning. I was directed to accompany and remain with him, and my duties with the corps as medical director were turned over to the surgeon next in rank. General Jackson had previously declined to permit me to go with him to Guinea's, because complaints had been so frequently made of general officers, when wounded, carrying off with them the surgeons belonging to their commands. When informed of this order of the commanding-general he said," General Lee has always been very kind to me, and I thank him." Very early Tuesday morning he was placed in an ambulance and started for Guinea's station, and about 8 o'clock that evening he arrived at the Chandler house, where he remained till he died. Captain Hotchkiss, with a party of engineers, was sent in front to clear the road of wood, stone, etc., and to order the wagons out of the track to let the ambulance pass. The rough teamsters sometimes refused to move their loaded wagons out of the way for an ambulance until told that it contained Jackson, and then, with all possible speed, they gave the way and stood with hats off and weeping as he went by. At Spotsylvania Courthouse and along the whole route men and women rushed to the ambulance, bringing all the poor delicacies they had, and with tearful eyes they blessed him and prayed for his recovery. He bore the journey well, and was cheerful throughout the day. He talked freely about the late battle, and among other things said that he had intended to endeavor to cut the Federals off from United States ford, and taking a position between them and the river, oblige them to attack him; and he added, with a smile: "My men sometimes fail to drive the enemy from a position, but they always fail to drive us away." He spoke of Rodes, and alluded in high terms to his magnificent behavior on the field Saturday evening. He hoped he would <shv14_160>be promoted. He thought promotion for gallantry should be made at once, upon the field and not delayed. Made very early, or upon the field, they would be the greatest incentives to gallantry in others. He spoke of Colonel Willis (subsequently killed in battle), who commanded the skirmishers of Rodes's division, and praised him very highly, and referred to the deaths of Paxton and Boswell very feelingly. He alluded to them as officers of great merit and promise. The day was quite warm, and at one time he suffered from slight nausea. At his suggestion, I placed over his stomach a wet towel, and he expressed great relief from it. After he arrived at Chandler's house he ate some bread and tea with evident relish, and slept well throughout the entire night. Wednesday he was thought to be doing remarkably well. He ate heartily for one in his condition, and was uniformly cheerful. I found his wounds to be very well to-day. Union by the first intention had taken place to some extent in the stump, and the rest of the surface of the wound exposed was covered with healthy granulations. The wound in his hand gave him little pain, and the discharge was healthy. Simple lint and water dressings were used, both for the stump and hand, and upon the palm of the latter a light, short splint was applied to assist in keeping at rest the fragments of the second and third metacarpal bones. He expressed great satisfaction when told that his wounds were healing, and asked if I could tell from their appearance how long he would probably be kept from the field. Conversing with Captain Smith a few moments afterwards, he alluded to his injuries, and said, "Many would regard them as a great misfortune; I regard them as one of the blessings of my life." Captain Smith replied: "All things work together for good to those that love God." "Yes," he answered, "that's it, that's it." At my request Dr. Morrison came to-day and remained with him. About 1 o'clock Thursday morning, while I was asleep upon a lounge in his room, he directed his servant (Jim) to apply a wet towel to his stomach to relieve an attack of nausea, with which he was again troubled. The servant asked permission to first consult me, but the General knowing that I had slept none for nearly three nights, refused to allow the servant to disturb me, and demanded the towel. About daylight I was aroused, and found him suffering great pain. An examination disclosed pleuro-pneumonia of the right side. I believed, and the consulting physicians concurred in the opinion, that it was attributable to the fall from the litter the night he was wounded. The General himself referred it to this accident. I think the disease came on too soon after the application of the wet cloths to admit of the supposition, once believed, that it was induced by them. The nausea, for which the cloths were applied that night, may have been the result of inflammation already begun. Contusion of the lung, with extravasation of blood in his chest, was probably produced by the fall referred to, and shock and loss of blood prevented any ill effects until reaction had been well established, and then inflammation ensued. Cups were applied, and mercury, with antimony and opium, administered. Towards the evening he became better, and hopes were again entertained of his recovery. Mrs. Jackson arrived to-day and nursed him faithfully to the end. She was a devoted wife and earnest Christian, and endeared us all to her by her great kindness and gentleness. The General's joy at the presence of his wife and child was very great, and for him unusually demonstrative. Noticing the sadness of his wife, he said to her tenderly: "I know you would gladly give your life for me, but I am perfectly resigned. Do not be sad. I hope I may yet recover. Pray for me, but always remember in your prayers to use the petition, 'Thy will be done.'" Friday his wounds were again dressed, and although the quantity of the discharge from them had diminished, the process of healing was still going on. The pain in his side had disappeared, but he breathed with difficulty, and complained of a feeling of great exhaustion. When Dr. Breckenridge (who, with Dr. Smith, had been sent for in consultation) said he hoped that a blister which had been applied would afford him great relief, he expressed his own confidence in it, and in his final recovery. Dr. Tucker, from Richmond, arrived on Saturday, and all that human skill could devise was done to stay the hand of death. He suffered no pain to-day, and his breathing was less difficult, but he was evidently hourly growing weaker. When his child was brought to him to-day he played with it for some time, frequently caressing it and calling it his "little comforter." At one time he raised his wounded hand above his head and closing his eyes, was for some moments silently engaged in prayer. He said to me: "I see from the number of physicians that you think my condition dangerous, but I thank God, if it is His will, that I am ready to go." About daylight on Sunday morning Mrs. Jackson informed him that his recovery was very doubtful, and that it was better that he should be prepared for the worst. He was silent for a moment, and then said: "It will be infinite gain to be translated to Heaven." He advised his wife, in the event of his death, to return to her father's house, and added: "You have a kind and good father, but there is no one so kind and good as your Heavenly Father." He still expressed a hope of his recovery, but requested her, if he should die, to have him buried in Lexington, in the Valley of Virginia. His exhaustion increased so rapidly that at 11 o'clock Mrs. Jackson knelt by his bed and told him that before the sun went down he would be with his Saviour. He replied: "Oh, no; you are frightened, my child; death is not so near; I may yet get well." She fell over upon the bed, weeping bitterly, and told him again that the physicians said there was no hope. After a moment's pause he asked her to call me. "Doctor, Anna informs me that you have told her that I am to die to-day; is it so?" When he was answered, he turned his eyes toward the ceiling and gazed for a moment or two as it in intense thought, then replied: "Very good, very good, it is all right." He then tried to comfort his almost heart-broken wife, and told her that be had a great deal to say to her, but he was too weak. Colonel Pendleton came into the room about 1 o'clock, and he asked him, "Who was preaching at headquarters to-day ?" When told that the whole army was praying for him, he replied: "Thank God, they are very kind." He said: "It is the Lord's Day; my wish is fulfilled. I have always desired to die on Sunday." His mind now began to fail and wander, and he frequently talked as if in command upon the field, giving orders in his old way; then the scene shifted and he was at the mess-table, in conversation with members of his staff; now with his wife and child; now at prayers with his military family. Occasional intervals of return of his mind would appear, and during one of them I offered him some brandy and water, but he declined it, saying, "It will only delay my departure, and do no good; I want to preserve my mind, if possible, to the last." About half-past one he was told that he had but two hours to live, and he answered again, feebly, but firmly, "Very good, it is all right." A few moments before he died he cried out in his delirium, "Order A. P. Hill to prepare for action ! Pass the infantry to the front rapidly! Tell Major Hawks ," then stopped, leaving the sentence unfinished. Presently a smile of ineffable sweetness spread itself over his pale face, and he cried quietly and with an expression as if of relief, "Let us cross over the river and rest under the shade of the trees "; and then, without pain or the least struggle, his spirit passed from earth to the God who gave it.